In the middle of cultural challenges, Turkish Christians cling to Christ. Seyhan Tekih grew up as a Muslim in Uşak, Turkey. One day, a man approached her on the street, asking if she’d like to attend a concert in the city that night. Seyhan decided to go, not knowing the concert was Christian and that she would meet followers of Jesus for the first time in her life. After that night, she couldn’t stop reading the Bible and other books she received from those Christians. Then she had a dream in which Jesus appeared to her in a cave surrounded by bright light. It became clear to her: she had no choice but to follow Jesus. It wasn’t long before Seyhan’s father and mother found out she had left Islam. To them, that was the same as saying she was no longer Turkish. They disowned their daughter, and even now—eight years later—Seyhan rarely speaks to them. She moved to Istanbul to start over, where she began attending the church pastored by a WorldVenture worker*. There, she found an encouraging group of believers from all over the world. The church rallied around Seyhan when her life became even more difficult. One day, her boss called Seyhan into her office. “Are you a Christian?” she asked Seyhan. Even though Seyhan knew what was coming, she couldn’t lie. “Then pack your things now and go. You no longer work here,” her boss said. Following Jesus has meant a series of losses: her family, her job, her apartment when she couldn’t afford rent, and many of her friends. Thankfully, her church has helped; she’s been welcomed in the homes of other believers as she searches for new opportunities. Most days, Seyhan doesn’t know how long she can endure, as her life never seems to get easier. Istanbul is a city that has captured the hearts of visitors and its own inhabitants for centuries. The Bosphorus Strait offers a lifeline through the heart of the city, separating Asia from Europe, and east from west. Two million people cross it every day, many on double-decker ferries where they drink cay, black tea, as they float steadily past the Hagia Sophia and Blue Mosque. The Galata Bridge is home to the iconic fishermen who cast their massive poles into the Bosphorus, catching fish that will grace the markets and restaurants later that day. Men play backgammon in the streets on small, rickety tables, yet again drinking the Turkish cay out of tulip-shaped glasses. There is nothing normal about Istanbul. As Turkey’s bestselling female writer, Elif Shafak, puts it, Istanbul is a city that “defies all clichés.” As you wander its streets and observe its people, you find some women wearing hijabs (head covering), some niqabs (full-body covering with eye slits), and some in tank tops and miniskirts. Some Turks enjoy caring for and feeding the myriad noble Persian cats that roam—and possibly even rule—over the city, but some mistreat them. In Taksim Square, Syrian refugee boys sell water bottles and kick around soccer balls. In another neighborhood, hipster youth dress in 1940s-era skirts and pants to swing dance together in a basement. Nobody’s story in any city is the same. But Istanbul makes that especially believable—and exciting. What’s also exciting to WorldVenture workers in Turkey—beyond the rich, warm culture of Turkey—is the way they are seeing the kingdom of God moving in what many Americans assume is a place too difficult and unfathomable to go spread the gospel. Common mission statistics rank Turkey as No. 8 with the most unevangelized people in the world, where 0.01 percent are evangelical Christian. But that statistic does not reflect the actual growth of the church, from approximately five believers in the 1960s, to more than 5,000 believers today, according to WorldVenture workers Tom* and Rachel*. Turkey also boasts a national church association led by mostly Turkish believers. Tom and Rachel have lived in Turkey for over 20 years. Part of their ministry involved supporting a national pastor, but they soon found certain people in the community hostile to the local church. When the church first rented its own building, a series of fires, broken windows, and other instances of vandalism followed. Tom remembers being chased by a Turkish man with a long butcher knife, barely escaping when he climbed into his van. The van window still shows the marks left by the knife. A policeman witnessed the incident but did nothing. Despite such difficulties, the good far outweighs the bad. Recently, a friendly woman in her 30s asked to meet with Tom and Rachel at a coffee shop to ask them questions about Christianity. After Rachel started weekly Bible studies with her and another national believer, the woman joyfully decided to follow Jesus. The change in this woman was evident, prompting her husband to meet Tom and Rachel, even going so far as to stop attending the local mosque. “I can see the changes in my wife and I want what she has,” he told Tom and Rachel. Sarah*, another WorldVenture worker, works with various students, and just within the last few years has witnessed increased interest and activity among these searching young people. The students Sarah knows have begun to ask question after question and want to know more about Christianity. “We’re seeing that even in the midst of the chaos, there’s just a hunger [to find truth],” said Sarah. Recently, Sarah witnessed the salvation of an entire family, as well as their excitement to spread the gift of Jesus to everyone they know. Another instance found Sarah traveling with a friend for two hours outside the city to meet a young woman, Elise*, who expressed a desire to learn about Christianity through their website. After that first meeting, the girl read through all of John and half of Acts in just a few days, and Sarah found 129 text messages on her phone from Elise and Sarah’s friend: Elise had decided to follow Christ. WorldVenture workers do not take lightly the dark spiritual strongholds in the country, from the prayer calls declaring the Muslim Creed five times a day, to the lies being told about Jesus and the gospel. The centuries-old conflicts in the region of Turkey remain in recent memory for many Turks, creating barriers to receive the gospel to this day. Constantinople, once the capital of the Byzantine Empire and the center of the Greek Orthodox Church, struggled to hold back the rising Ottoman Turks from the east. However, European crusaders were actually the first to destroy Constantinople. The tug-of-war ended two hundred years later in 1453 when the Ottoman Empire conquered the city. The Ottoman Empire was still a strong force by World War I, when it joined the Central Powers. After the fall of the Central Powers, Turkey reformed as a republic government in 1923 with a liberal progressive presidency under Kemal Ataturk. Within five years, Islam lost its place as the state religion, yet many officials have since advocated for a pro-Islamic government. Turkey now holds a fine balance between Eastern and Western influences, its deeply rooted heritage alongside continual modernization. Another source of tension has been rising terrorism since the late 20th century. Bombings by minority militant groups and the Islamic State have killed approximately 280 people in Turkey over the past year alone. Christians have also found themselves targeted by terrorism. In 2007, three Christians were murdered at a Bible publishing house in Malatya, southeastern Turkey. The five suspects found by police at the scene were released from prison seven years later, and the trial still has not reached a verdict. Despite ongoing violence and instability, Turkey has moved forward in negotiating membership into the European Union and Syrian refugee deals. Sources in Turkey have noticed a polarization between those who want to become more like countries in the Middle East or the West. “It’s a country with an identity crisis,” said one worker. That doesn’t discourage World-Venture workers in Turkey from sharing with everyone, as they understand that only God knows who will receive the truth. “In the parable of the sower, you see he doesn’t just sow on the good soil. It’s too hard to differentiate or to figure out. You need to sow widely,” said another worker. For native Turks, to be Turkish is to be Muslim. Evangelical Christians, including those who are ethnically Turkish, are scarce, ranking as statistically zero percent within the country’s 79.5 million people. In the first thousand years after the Great Commission, the region of Turkey hosted many significant events in early church history. It was home to the Christians in Ephesus, Antioch, and Galatia. It was the land Paul traveled to preach the gospel to Gentiles. It was also the location of all seven churches addressed in the book of Revelation. When Paul taught a group of disciples in Ephesus, Acts 19:10 records, “This went on for two years, so that all the Jews and Greeks who lived in the province of Asia heard the word of the Lord.” The gospel’s influence grew to the point that one silversmith of idols rallied a protest, saying, “And you see and hear how this fellow Paul has convinced and led astray large numbers of people here in Ephesus and in practically the whole province of Asia” (Acts 19:26a). Christian faith endured waves of persecution and tolerance until Constantine’s conversion, after which it became the official religion of the ‘First Council of Nicaea, which began a legacy of ecumenical councils to correct popular heresies and unify Church doctrines. However, the Church would later divide into the Western Roman Catholic and Eastern Greek Orthodox churches. The Byzantine Empire grew weaker, threatened by a new Eastern power. 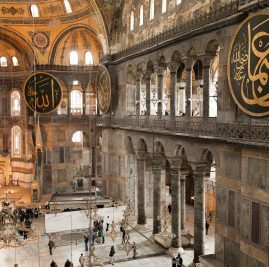 When the Ottomans conquered Constantinople in 1453, Islam became the new majority religion and has maintained its stronghold since then. The Joshua Project ranks Turks as the sixth most unreached people group in the world with over 53 million people. Yet, WorldVenture workers have seen God moving the hearts of Turks. Join WorldVenture workers serving in major cities of Turkey, either as a short-term intern or long-term teammate. More help is needed to share the gospel, disciple seekers of truth, and plant churches among Turks. There are endless ways you can be a part of this valuable outreach to Turkey’s unreached peoples. Pray for a movement within Turkey of open hearts to the gospel and genuine seekers of truth. Pray for God to send more workers to join the team in Turkey and expand their outreach. Pray for the Church to experience a revival and for faith in Christ to spread across Turkey. If God leads you to give financially or offer other support for workers in Turkey, please contact WorldVenture.